P. Olson, Mechanics of Flood Basalt Magmatism. T.T. Gribb, S. Zhang, and R.F. Cooper, Melt Migration and Related Attenuation in Equilibrated Partial Melts. D.L. Kohlstedt and P.N. Chopra, Influence of Basaltic Melt on the Creep of Polycrystalline Olivine under Hydrous Conditions. D.W. Sparks and E.M. Parmentier, The Generation and Migration of Partial Melt beneath Oceanic Spreading Centers. A. Nicolas, F. Boudier, and B. Ildefonse, Dike Patterns in Diapirs beneath Oceanic Ridges: The Oman Ophiolite. M.P. Ryan, Neutral-Buoyancy Controlled Magma Transport and Storage in Mid-ocean Ridge Magma Reservoirs and Their Sheeted-Dike Complex: A Summary of Basic Relationships. J.P. Morgan, A. Harding, J. Orcutt, G. Kent, and Y.J. Chen, An Observational and Theoretical Synthesis of Magma Chamber Geometry and Crustal Genesis along a Mid-ocean Spreading Center. A. Hasegawa and D. Zhao, Deep Structure of Island Arc Magmatic Regions as Inferred from Seismic Observations. J.H. Davies, Lateral Water Transport across a Dynamic Mantle Wedge: A Model for Subduction Zone Magmatism. M. Heimpel and P. Olson, Buoyancy-Driven Fracture and Magma Transport through the Lithosphere: Models and Experiments. A. Takada, Accumulation of Magma in Space and Time by Crack Interaction. H. Sato and M.P. Ryan, Generalized Upper Mantle Thermal Structure of the Western United States and Its Relationship to Seismic Attenuation, Heat Flow, Partial Melt, and Magma Ascent and Emplacement. G.W. Bergantz and R. Dawes, Aspects of Magma Generation and Ascent in Continental Lithosphere. C.R. Carrigan, Two-Component Magma Transport and the Origin of Composite Intrusions and Lava Flows. J.A. Whitehead and P. Kelemen, Fluid and Thermal Dissolution Instabilities in Magmatic Systems. Author Index. Geographic Index. SubjectIndex. 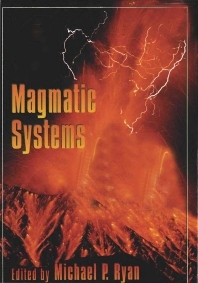 With its integrated and cohesive coverage of the current research, Magmatic Systems skillfully explores the physical processes, mechanics, and dynamics of volcanism. The text utilizes a synthesized perspective--theoretical, experimental, and observational--to address the powerful regulatory mechanisms controlling the movement of melts and cooling, with emphasis on mantle plumes, mid-ocean ridges, and intraplate magmatism. Further coverage of subduction zone magmatism includes: Fluid mechanics of mixed magma migration Internal structure of active systems Grain-scale melt flow Rheology of partial melts Numerical simulation of porous media melt migration Nonlinear (chaotic and fractal) processes in magma transport In all, Magmatic Systems will prove invaluable reading to those in search of an interdisciplinary perspective on this active topic. Researchers in volcanology, igneous petrology, tectonophysics, seismology, geodesy, and planetology. James R. Holton was Professor of Atmospheric Sciences at the University of Washington until his death in 2004. A member of the National Academies of Science, during his career he was awarded every major honor available in the atmospheric sciences including AGU’s Revelle Medal.